Add a magnet to your ATV and pick up metal debris easily. Why equip an ATV with a magnet? ATV’s might not seem like an obvious choice as a vehicle to attach a magnetic sweeper to, but the combination is more effective than one might first imagine. ATV’s have become incredibly common, not only as pleasure recreational vehicles but as work vehicles because they can go anywhere, transport relatively easily, cost less than other vehicles, and are easy to hop off and on quickly in situations where workers need to get in and out of a vehicle all the time in the performance of their work. Not only all these things, but add to it that people just simply enjoy riding them and it’s a potent combination. 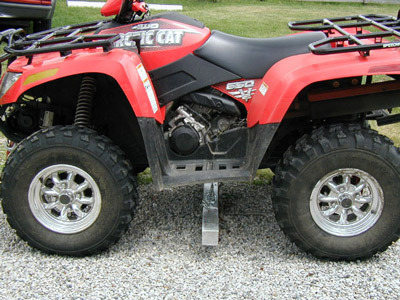 Why use an ATV magnet? ATV’s are being used in obvious situations such as on farm operations, and to get around larger industrial sites, but they are also being used by the military, Fire/Rescue teams, disaster relief organizations such as The Salvation Army, Police organizations, Border Patrol, lifeguards/beach patrols, etc. 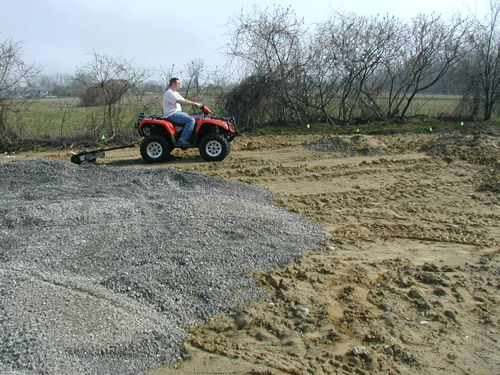 Not all of these ATV users would need or use magnets but there are several of them where magnets do add substantial value because of the high occurrence and prevalence of debris, particularly on farm applications, large industrial and commercial sites and disaster relief clean-up operations. Attach to the front of the ATV like a snowplow. Attach behind the ATV using a ball or wagon style pin hitch. I love the Longhorn! It just tracks the terrain so well up or down even steeper grades because of the casters. It looks awesome, performs great, there’s nothing to screw up, and makes so much sense to pick up the debris before driving over it. To me it makes sense, you can buy the whole ATV and the Longhorn combined for the price of some big front mounts or big tow behinds, and this is so versatile and can do the same job. 1. 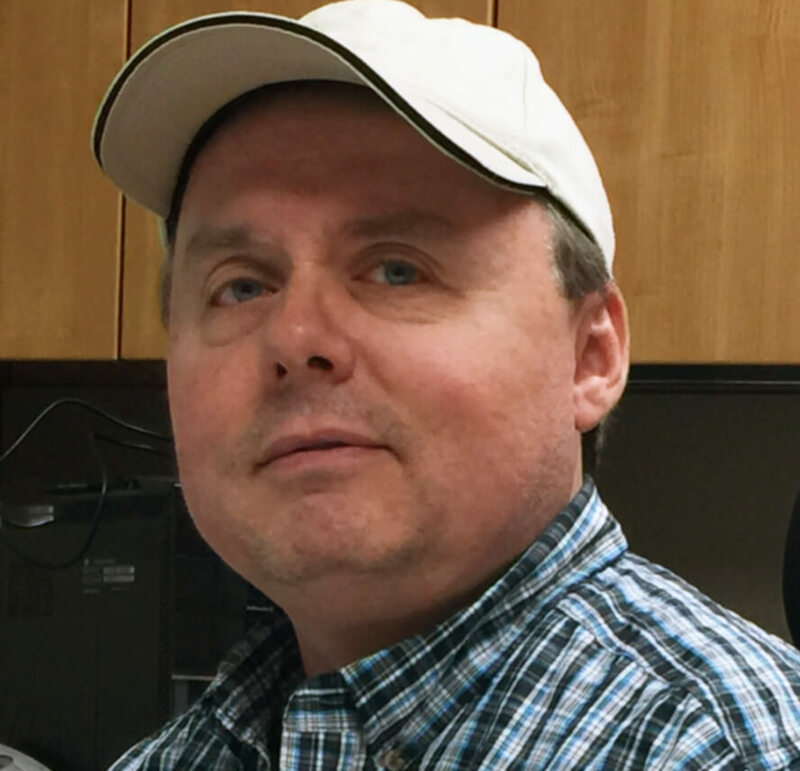 What is the danger posed by the debris problem? 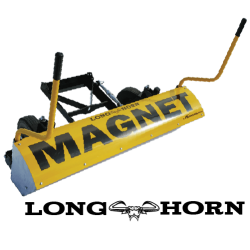 If you have an extensive debris problem that will almost certainly cause a flat tire if you run over the debris, then a front mount magnetic sweeper is a necessity and may be the only consideration in your choice of magnet. A front mounted magnetic sweeper will pick up debris like nails before you run over it, something that seems obviously and practically much better than running over the debris before picking it up. 2. How much do you want to spend on an ATV magnet? While picking up debris before running over it seems intuitively much better, it’s also a much more complex solution, because it requires a much more complex mounting system and weight must be kept down while still maintaining performance. Hanging magnets are the most cost effective because a hanging magnet is essentially just a big magnet bar without most of the other mechanism’s that accompany either a tow behind magnet or a front mount magnet. 3. Are you able to leave a magnet mounted on the ATV? Given the other tasks the ATV is used for are you able to leave a tow behind or front mount or hanging mid mounted magnet on the ATV all the time. If not, then the tow behind solution may be best for you because it can be easily and quickly hitched up when needed. 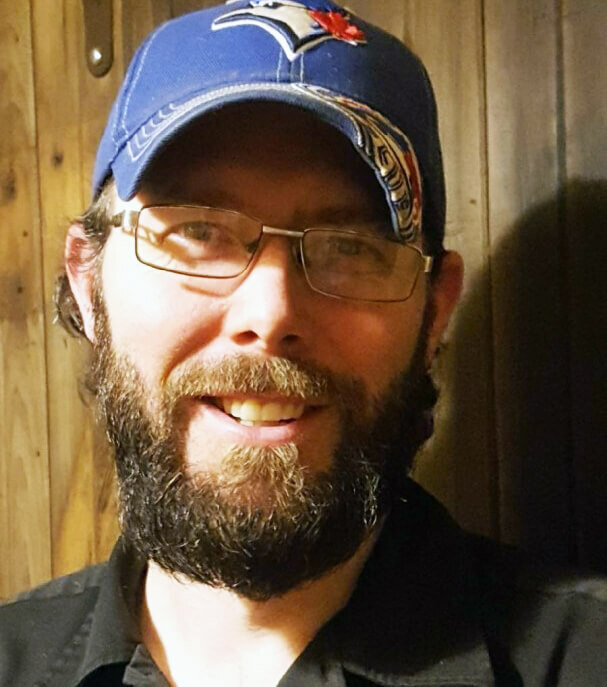 A hanging magnet or front mount magnet will be a bit more involved and take more time to mount and demount from the ATV when you want to. 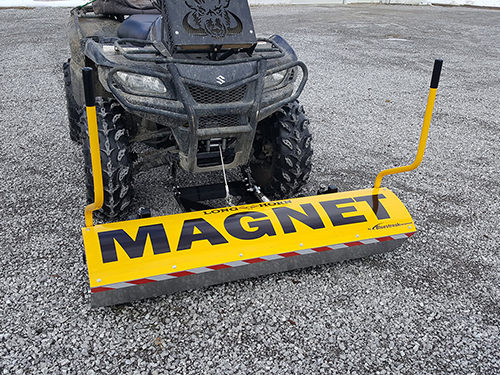 On the other hand, if you can mount a magnet permanently on your ATV, it’s going to work for you all the time while you’re driving around and it saves you the time of temporarily mounting and demounting it. Therefore if you can leave a magnet mounted, a permanently mounted solution is usually better. 4. How easy is the ATV magnet to clean off? 5. How good is the ATV magnet at hanging on to the debris that it picks up? Hanging magnets are by far the biggest bang for your dollar, you don’t need a very wide one for an ATV, but get the strongest one, the 4.5x4.5, or the 3x3, so you can hang it a bit higher, you’ll be shocked by what they pick up, I know I was the first time I saw one mounted and used. I thought it would seem crazy having a magnet mounted under the ATV, that it would rattle or knock around but it wasn’t, it worked great. If you really have embedded debris and want to dig it up then the Debris Digging Rake will do it but you can only use a Debris Digging Rake with a tow-behind. 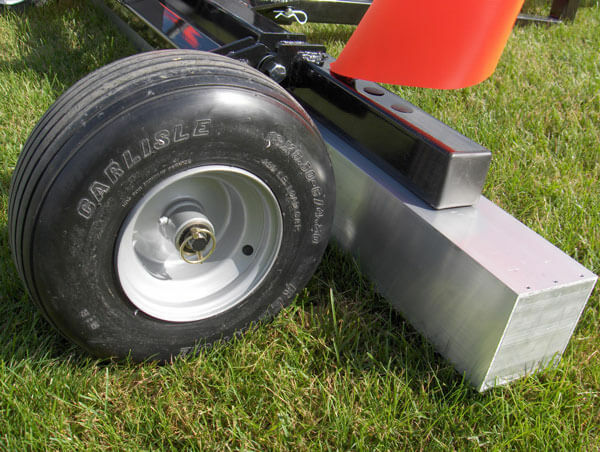 Other than loosening up buried debris or in hardened ground to make it easier for the magnet to pick it up, the Debris Digging rake also grooms the ground some also, smoothing out the lumps and filling in holes some. It’s also great because you can see where you’ve already swept. If you’re choosing a Hanging Magnet, consider a sleeve to make clean off quicker and easier. Helps protect sweeper housing when hitting hard surfaces. Constructed out of durable PVC and molded to wrap around the magnetic housing. Locks in place and will not move when sweeper is in use. The Longhorn is a great front mount option for commercial, industrial or disaster relief users that want a simple but highly durable robust magnetic sweeper because they have a lot of clean up to do or have a continuous need over time. The Longhorn allows you to pick up metal debris before you run over it. Leave it permanently mounted or quickly attach and detach when needed. Utilizes your ATV winch. Loads of Options for Off Road Work! 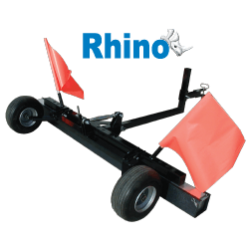 The Rhino magnetic sweeper is a simple, durable and robust wagon hitch tow behind design. It has a bit more pickup power than the Longhorn because the Rhino has a wagon hitch and can carry the weight of the extra magnets. The flat proof tires, power, adjustable sweeping height and hitch height and optional quick clean off sleeve and debris digging rake make this a perennial favourite with commercial users. Available in 3 widths. Severe duty tow behind magnet! 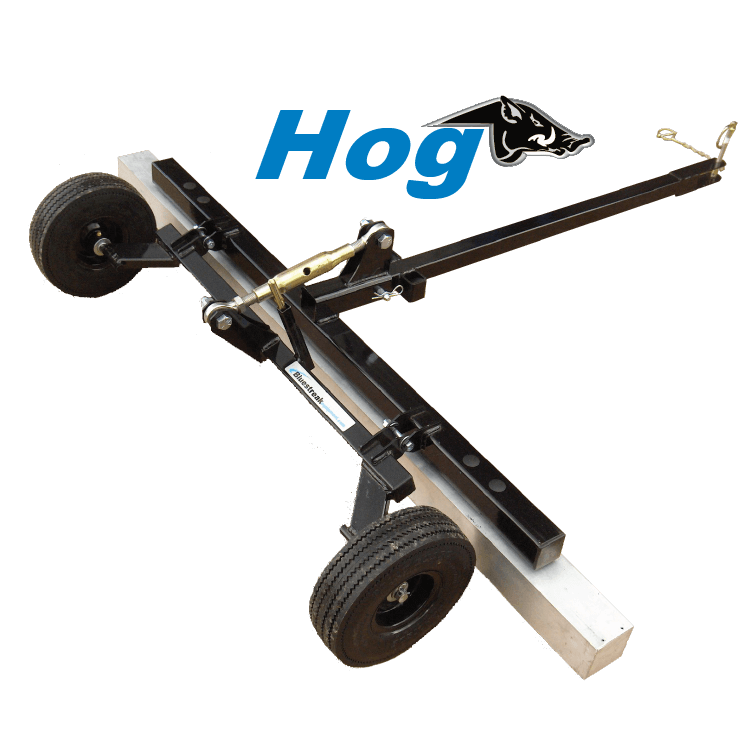 The HOG magnetic sweeper is an off road tow behind design that’s a smaller version of the Rhino.It is the little brother of the Rhino, this tow behind design is a good choice for those that love the Rhino but want a lower price point because they have less frequent need of a magnetic sweeper. Economical ATV Hanging Magnetic Bar. Easily attach to your ATV in a variety of positions. The Wrasse magnetic bar is the most economical solution for picking up debris with your ATV! The most economical because you’re just paying for a big bar magnet. Hang it underneath with the two included mounting chains and you’re off and ready to go! 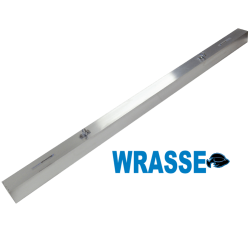 The Wrasse comes in three different magnet strengths and 7 different widths to suit your budget and needs. 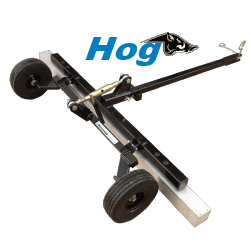 Maximum Lifting Height 4 3/4" 6" 8 1/2" 8 1/2" 6" 7 1/4"
Sweeper Widths 26", 38", 50", 62", 74", 86", 98" 26", 38", 50", 62", 74", 86", 98" 26", 38", 50", 62", 74", 86", 98" 62", 74", 86" 62" 54"